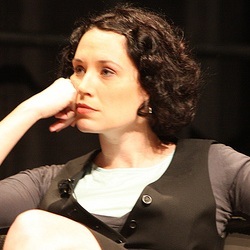 Sarah Lacy is the founder, editor-in-chief, and chief executive officer of PandoDaily, a web publication that offers technology news, analysis, and commentaries about Silicon Valley-based startups. Lacy is also an award winning journalist and author of two critically acclaimed books, Once You’re Lucky, Twice You’re Good: The Rebirth of Silicon Valley and the Rise of Web 2.0 and Brilliant, Crazy, Cocky: How the Top 1% of Entrepreneurs Profit from Global Chaos. Lacy has been a reporter in Silicon Valley for nearly fifteen years covering everything from the tiniest startups to the largest public companies. She was formerly a staff writer and columnist for BusinessWeek, the founding co-host of Yahoo Finance’s Tech Ticker, and a senior editor at TechCrunch. Born on December 29, 1975, Lacy currently lives in San Francisco, California. CouchSurfing Raises $7.6 M; Will Users Cry “Sell Out”? DISRUPT Comes to Beijing This Fall. Buy Your Tickets Now! Does a Cop Have a Right to Your Smartphone? New technologies usually allow for <em>more</em>. In the move from print media to the Web the "more" was comments, slideshows and of course rapid-fire content. In the move from VHS to DVDs the "more"
Qunar Baidu Deal Closes. How This Could Ripple Through Chinese Startups.